Espers will battle for no more than 90 seconds, then dismiss themselves. Therefore, in order to get the most utility from your esper, set the battle speed to fastest. 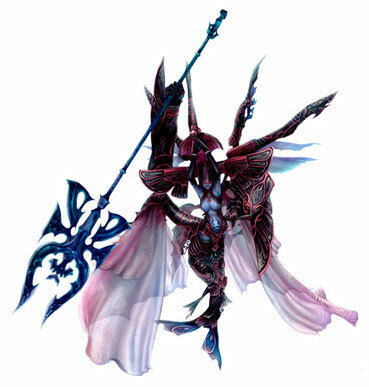 Espers do not gain experience through battle; experience levels are concurrent with that of the summoner. If Vaan is at level 30, the esper summoned is also at level 30. Maximum MP for espers are randomized for each summon. It is difficult to trigger some espers' final attack, the most powerful attack. See individual triggers below. All espers have the same Max MP and Speed attributes by level, but differ in all other attributes. Scion of darkness and guardian of the Holy Realm, made by the gods in opposition to Loghrif the Transcendent, scion of light. 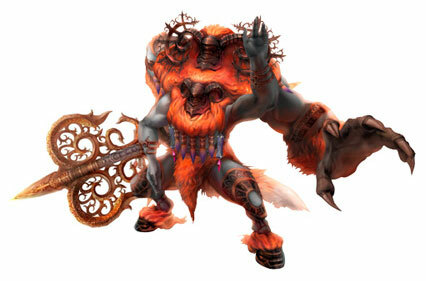 Called the Gigas for his appearance: man and monster fused as one. 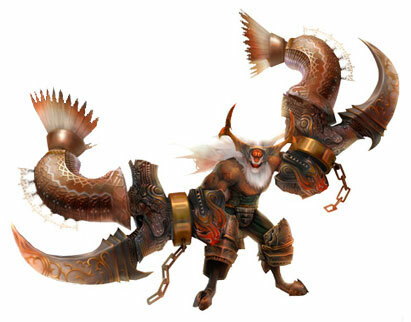 Considered a mistake upon his making, and receiving not his intended role, the Gigas challenged the gods and lost. Scorned by his masters, he found another: the Dynast-King, whose tomb he swore to protect for eternity. Belias is encountered in the storyline at the Tomb of Raithwall. Scion of darkness ruling and protecting those who live in the underworld, in opposition to Lahabrea the Abyssal Celebrant and scion of light. In the course of his rule, he submitted to avarice, and the darkness took his heart, transforming him until he was both evil and corrupt. Then in his cowardice did he bind a Goddess of the Demesne of Ice, and using her as a living shield, he challenged the gods. Defeated before their might, he fell screaming into the depths of hell, there to be imprisoned for eternity. Mateus is encountered in the storyline at the Stilshrine of Miriam. 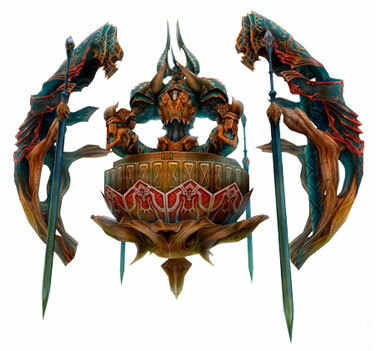 Emperor among the scions, able to reduce to nothing aught he strikes with a single vengeful blow of his fist, created in opposition to Deudalephon the Benevolent, scion of light. Though he was made by the gods to quell the fiends that raged in the Otherworld, his immense strength and fearsome visage drew the fiends to his side, and turned him against his creators. Adrammelech rose to prominence in the Otherworld, whence he led a fiendish horde against the gods, but in the end, he was defeated. Adrammelech can be encountered in the Zertinian Caverns after Tomb of Raithwall. He resides at Athroza Quicksands, in the central region of the caverns. Heretic scion who wrapped the world in dark energies, seeking to take the souls of all living things unto himself. 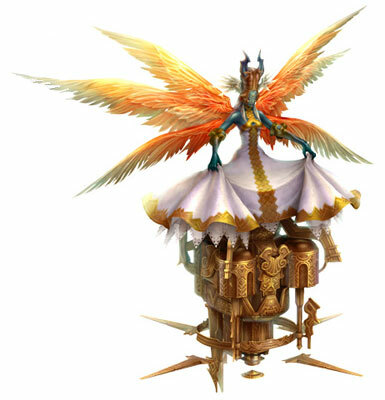 Created in opposition to Emet-Selch, Angel of Truth, and scion of light. 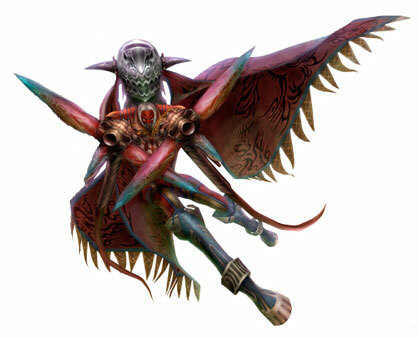 Originally tasked with the judging of men upon their deaths, his soul was tainted by the curses of those who raged against the heavens, and seizing one of the gods' servants, a shamaness, as a hostage, he rebelled against his creators. Even now, in defeat, he clutches the shamaness to him in his right arm, and with the aid of her death-wail does he summon the soul of darkness to do his bidding. 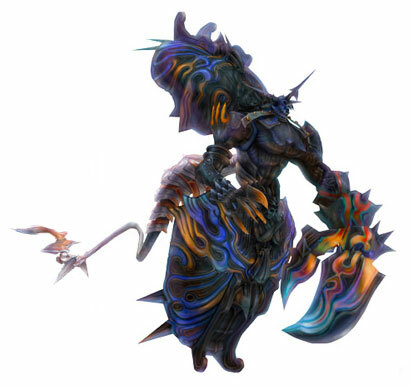 Zalera can be encountered in the Barheim Passage after Tomb of Raithwall. 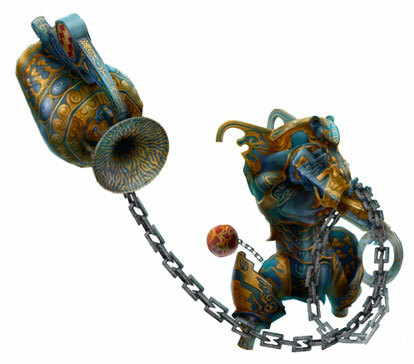 Complete the Dalmasca's Desert Bloom and Marauder in the Mines hunts to unlock the Barheim Passage. Enter the Passage from Dalmasca Estersand / Murmuring Defile, south of Banks of the Nebra. Zalera resides at Terminus No. 7, west of where you entered from. Scion that is both horse and woman, wielding utter control over the souls that wander the underworld, in opposition to Igeyorlm the Martyr, scion of light. Though she once served the gods as a guardian, when Ultima announced her rebellion, Shemhazai went to her, whispering of the gods' hidden weaknesses. She then descended upon the land without leave of the gods, and taught men of destruction and evil. For this was she striken down and bound. Mateus is encountered during the storyline at Giruvegan. Scion created to rid the world of its impurities by swallowing them within himself, in opposition to Nabriales the Majestic, scion of light. 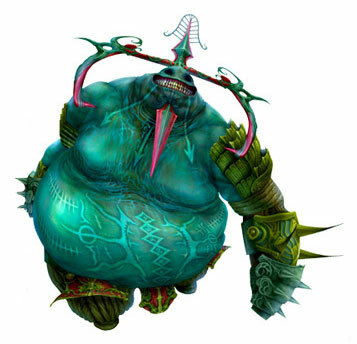 The world, however, was more filled with impurity and corruption than even the gods dared imagine, and having swallowed it all, the once beautiful Cúchulainn was transformed into a hideous thing, a deity of filth, and so did he turn against his creators. Wherever his feet should fall, there all life withers to dust. Ecounter Cúchulainn at the Garamsythe Waterway after Tomb of Raithwall. Obtain the Sluice Gate Key by completing the Waterway Haunting and Lost in the Pudding hunts. Activate the Waterway Control switches located at No. 3 Cloaca Spur and No. 4 Cloaca Spur to gain access to No. 1 Cloaca where Cúchulainn resides. 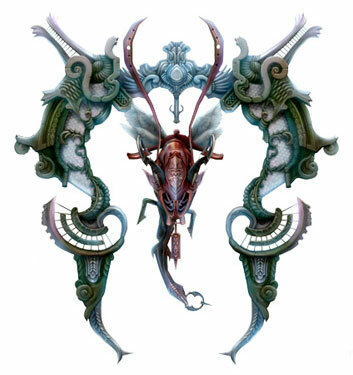 Most ancient of the scions, created in opposition to Halmarut the Arbiter, and scion of light. Tasked with keeping watch over the world, with the authority to judge the value of all things. As he watched, unseen, unknown, his attachment to the world dwindled, and faded until it was as nothing. Fitting that he would desire to make the world, too, as nothing. Yet he fell in the war against the gods, and was thwarted, imprisoned in punishment for his heresy. Encounter Exodus after the Salikawood Gate is fixed. In the south portion of Mosphoran Highwaste / Babbling Vale, activate the Shrine of the South Wind. Exit to Rays of Ashen Light in the north-east and feed the stray Chocobo a Gysahl Green. Ride the chocobo and exit south to the Empyrean Way, riding west over a floating weed near the map entrance. Ride past the Empyrean Way over a grassy stretch only Chocobos can pass through, west exit to Skyreach Ridge. Alight from Chocobo and west exit to Babbling Vale, activate the Shrine of the West Wind, hit the Weathered Rock to gain access to the main Babbling Vale area, and activate the Shrine of the Northwest Wind. Return to Skyreach Ridge and north-east exit to find Exodus in Empyrean Seat. 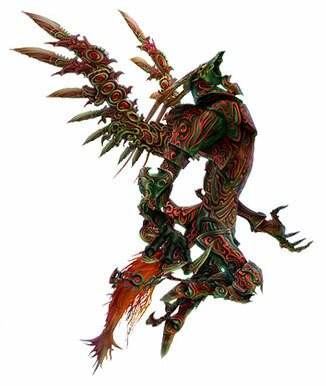 Scion set by the gods to wield and manipulate the laws of this world, and with holy power lead mankind to order. Created in opposition to Fandaniel the Protector, scion of light. Desiring to bring order to all things, he joined with Ultima in her battle against the gods. He gave his body to the Thousand-Years War, and when his strength was spent, down into the burning inferno he fell. Hashmal is encountered during the storyline at Pharos at Ridorana. Honoring the law more than any other, a scion of holy order and condemner of criminals. Created in opposition to Knight-Star Pashtarot, scion of light. He turns his deep, abiding hatred for those who break the law into living darkness, therein to plunge the guilty in fell judgment. Over time, he came to care less for upholding the law and more for condemnation, and so tainted by hate, he sought to condemn the gods themselves to death. Thus, did he earn the title "The Condemner", and thus did he fall from grace. Notice that for both Big Bang and Gravity Well, the lower Zeromus' HP, the more damage done. After the battle at Mt. Bur-Omisace, obtain the Stone of the Condemner by talking with the Acolyte at the Temple Grounds at the base of the stairs leading to the Hall of the Light. Return then to the Stilshrine of Miriam. Transport to Throne of Veiled Gods by using the Stone of the Condemner with the Way Stone at the end of Ward of Measure. The hideous, darkly clouded form of Famfrit, scion in opposition to Holy Queen Emmerololth, scion of light, was anathema even to his creators. Thus, after a great battle, was he broken and sealed within armor laced with wards. The confines of his armor are void of light, and so is he called the Darkening Cloud. Men fear the rain that falls from the black clouds that ooze from that giant ewer as a herald of chaos and waste. Famfrit is encountered during the storyline at Pharos at Ridorana. Tutelary deity of the sacred crystals fashioned by the gods at the time of the Great Making. Created in opposition to Mitron the Chasiter, scion of light. Upon entering the world of Man, he was enveloped in the turmoil rampant there. Lost, he died and was reborn countless times, a walker of life's wheel, eventually to rage against the gods that had so failed him. By sitting in meditation upon the Unrh Pedestal does he clear heart and mind until all that has order and reason and thought is made as nothing. In order to encounter Chaos, you must fist visit Archades during the storyline and have completed the Waterway Haunting, Lost in the Pudding, and Crime and Punishment hunts. You must also have spoken to Ma'kleou at Nabreus Deadlands / The Muted Scarp in order for Roh'kenmou to appear in Rabanastre. After these tasks have been completed, speak to Roh'kenmou in Dalan's house in Rabanastre Lowtown, then to Deeg in the North Sprawl residence. After reading the Dusty Letter on the table, speak to Deeg again then go to Central Waterway Control at Garamsythe Waterway. Open all the controls, turning off all the lights in the process. Close #11 control, close #4 control, open #11, close #3, and open #4. You should hear a chime after opening #4 and find a "shiny object" that is the Dull Fragment in the southern part of Central Waterway Control. Return to Dalan's and give to Roh'kenmou the Dull Fragment and Blackened Fragment (bounty from the Crime and Punishment hunt). After speaking to Filo in the south-east area of South Sprawl, find the Curious Woman by the fountain in Southern Plaza. Next, speak to the brown Bangaa Merchant in Muthru Bazaar. He tells you he sold an item of interest to a soldier, who turns out to be the Sotted Imperial that's besotted at Yugri's Magics. The Curious Woman he demands you to bring to him is no longer by the fountain, so find Kytes at Lowtown North Sprawl outsite of the entrance to Garamsythe Waterway. He tells you to speak again to Filo, who tlls you to return to Yugri's Magicks. Here you can finally obtain the Grimy Fragment to give to Roh'kenmou. 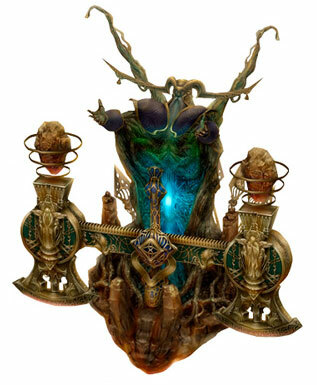 Travel to Archades, where you'll find Roh'kenmu at Charlotte's Magickery. He is looking to get back his medallion from Otto, who you can find in Old Archades / Alley of Muted Sighs. Your task continues to Nabreus Deadlands, where you will find Ma'kleou at The Muted Scarp. He sends you on a quest for yet another medallion, this one in the heart of Nabreus. Your next destination is Overlooking Eternity, which you can reach via hidden path in the north-eastern edge of The Slumbermead. The quest then takes you to Necrohol of Nabudis, which you can reach through th Salikawood or by traveling through Nabreus. Defeat Fury and Humbaba Mistant to open the path to Chaos' dwelling. Masterpiece among the scions created by the gods, and the mastermind of the plot to rise against them. Prior to her betrayal, she was tasked with guiding souls to heaven and aiding in their reincarnation. 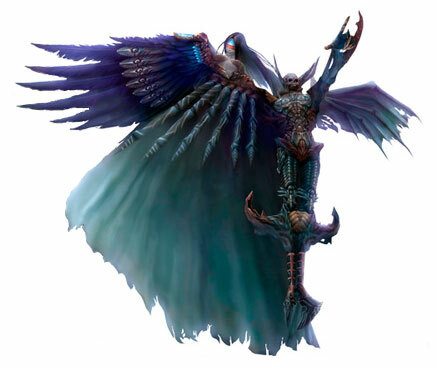 Called the High Seraph for her angelic wings of glimmering gold, yet it was on wings of deepest black that the tainted angel Ultima rose against the gods. Since her fall, her heart is without light, and impossible to know. Strongest of the scions created by the gods, they feared his growth, and so kept him a child. So indomitable is his strength that all things are by him twisted and pressed into oblivion. He alone fashions the laws governing all things, and administers punishment in place of the gods. So is he Keeper of Precepts, and his authority is absolute.